Along with wine, beer and cocktails, coffee has long been considered a beverage for adults. More and more teenagers, however, are consuming the caffeinated beverage, reports a study published in 2014 in “Pediatrics.” Although coffee can offer health benefits overall due to the antioxidants it contains, it can also have a detrimental effect -- meaning it might not be the healthiest beverage for a teen to consume. Coffee consumed in moderation is considered to have health benefits, says the Harvard School of Public Health. It can protect against type-2 diabetes, Parkinson’s disease, liver cancer and liver cirrhosis, as well as potentially decrease the risk of death from cardiovascular disease. Maudene Nelson of New York’s Institute of Human Nutrition told the "Chicago Tribune" that coffee may also improve concentration. Studies on coffee are typically done on adults, making it more difficult to determine the health effects on a teenager. A teenager might be concerned that drinking coffee could lead to stunted growth; however, this is a myth, according to “The New York Times.” Coffee doesn’t have any effect on how tall you grow, but the old wives' tale might have stemmed from the outdated notion that caffeine causes osteoporosis or diminished bone mass. It might have a slight effect on calcium, but as long as dietary intake is sufficient, caffeine does not cause bone loss. Teens aren’t necessarily known for making smart decisions, but regular caffeine consumption – equaling around 220 milligrams a day -- could increase their risk-taking behavior, as well as increase impulsivity, reports the National Council on Strength and Fitness. 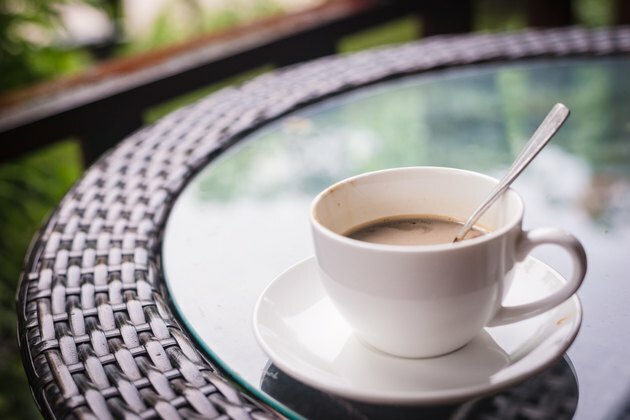 Four or more cups of caffeinated beverages a day is associated with regular cigarette use, aggressive behavior and attention problems, the council notes.